Spicy, Chunky Guacamole That You Won't Be Able To Stop Eating! 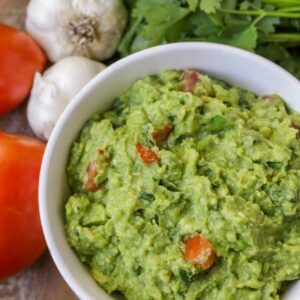 Filled With Avocados, Spices, Onion, Tomatoes, Garlic, Cilantro And More - This Easy But Addicting Dip Is Sure To Be A Crowd Pleaser. Place avocado and lime juice in a large bowl and mix until coated. Add salt, cumin, and cayenne and mash and mix avocado mixture using a potato masher or back of spoon. Fold in onions, tomatoes, cilantro and garlic. Add additional lime juice at end to help keep guacamole from browning.